Actor and Writer Kumail Nanjiani attends the 43rd Seattle International Film Festival Opening Night at McCaw Hall on May 18, 2017 in Seattle, Washington. 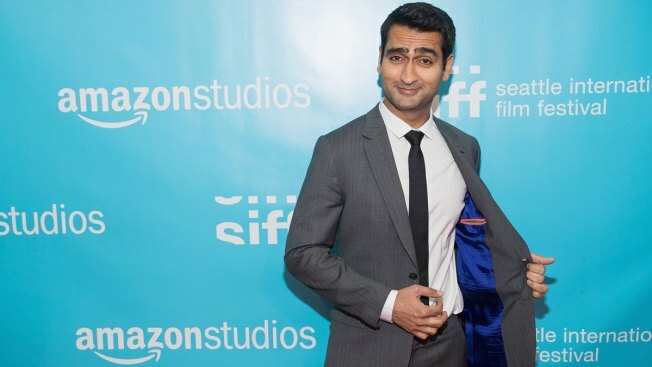 "The Big Sick" star Kumail Nanjiani is heading into awards season with a mix of fear and excitement. What started as a deeply personal, indie love story, co-written by Nanjiani and his wife Emily Gordon, became the must-see romantic comedy of the summer. "It has certainly exceeded expectations," said Nanjiani during a recent interview at his Los Angeles home. "It's been a lovely surprise." Set in Chicago, "The Big Sick," which also earned two Screen Actors Guild nominations, follows the couple's unique courtship through cultural conflicts, family ties and sickness. Nanjiani stars alongside Zoe Kazan in the Michael Showalter-directed film. "When we were showing it at Sundance, we were sitting next to each other at the first screening and she (Gordon) was like, 'This is the last time it will be our story,'" he recalled. "Definitely, you can't take it back. You know, we meet strangers and they think they know us because they do kind of know us." Fans also know his family, who can be seen lovingly portrayed on the big screen — and possibly in real life at a theater near you. "I get these tweets from people being like, 'I saw the movie and then there was like this older Pakistani couple that was like, 'Did you like it? That was our son!' So they've been like paying to go see it over and over," he said. Nanjiani is now back to work filming season five of HBO's "Silicon Valley" as he and Gordon plot their next move. "There's a feeling of confidence. There's also pressure. I don't know how to follow this," he said with a bulletin board of colorful post-it notes bearing plot points and character ideas looming nearby. "It's going to be hopefully funny and hopefully serious, but it's a totally different genre," said Nanjiani, who is careful not to divulge too much just yet. "I don't think we can write another lady-going-into-a-coma movie for a little while."